For many photographers the best time of day to take pics is during the magic hours. Think of the magic hours as EMH for photographers. It's the hour at the beginning of the day and at the end of the day. In Disney World I tend to sleep in so my chances of getting a good shot in the early magic hours are unlikely, unless I've stayed up all night. The evening magic hours are usually when we're dining in WDW so this was an unusual opportunity for me. We had just finished dinner at The Liberty Tree Tavern and as we walked over the bridge I knew the time was right. To grab this shot without a tripod, I braised myself on the railing of the bridge and hoped I would capture the sky's deep blue and the castle's rich purples. 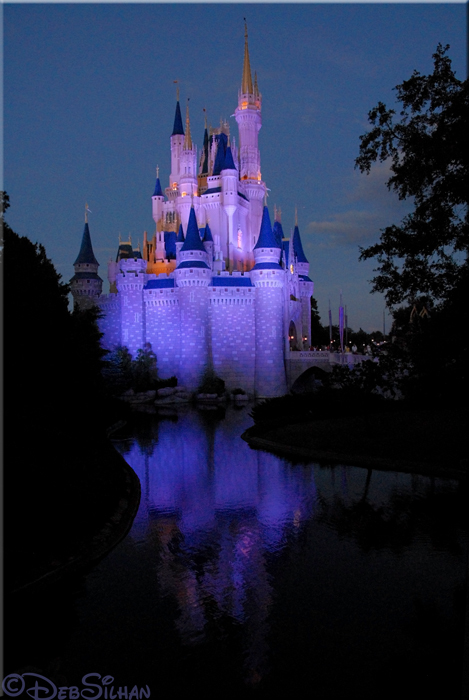 Of course, a wonderful bonus in this shot is the water color reflection created by the castle at this time of day. To provide some depth and framing, I included the trees and bushes on either side. I love the color palette, especially how the deep blue of the sky coordinates so well with the blues and purples of the castle! Beautiful! I love this picture! Gorgeous! Love the reflection in the water. You are truly talented. Beautiful job! Can we say "Postcard picture?" This is such a beautiful photo. Love it! Gorgeous! This phot makes me "home sick"